Comes with a free surge protector, too. There's still time to make good on your New Year's resolution to stop procrastinating. One way you can do that is by finally buying a uninterruptible power supply (UPS) for your PC to protect against power surges and outages. Concerned about the cost? 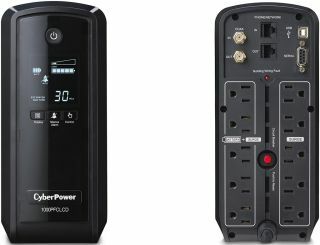 CyberPower's CP1000PFCLCD 1000VA is on sale at B&H Photo for a nickel shy of $100. The CP1000PFCLCD is a lower capacity version of the CP1500PFCLCD 1500VA, our top pick in battery backups. It offers 600W of sustained power delivery instead of 900W, though that should still be enough for most systems. Just as importantly, this is a true sine wave UPS. There are many UPSes in this price range (and higher) that provide only simulated sine wave output, which is a stepped sine wave that approximates what you get out of your wall outlet. Not all electronics play nice with simulated sine waves, but that is not a concern with this model. The CP1000PFCLCD 1000VA has 10 outlets, half of which are battery and surge protected (the other half are surge protected only). It also has USB and serial ports (one each), phone/Ethernet combo jacks, and coax protection. At full load, CyberPower claims the CP1000PFCLCD has enough juice to keep things running for 3 minutes, and 9 minutes at half load. This deal also includes an six-outlet surge protector that provides 750 joules of surge suppression. It's nothing fancy, but a nice bonus on what's already a great price. You can grab the CyberPower CP1000PFCLCD 1000VA UPS here.